In 1988 the State of New York directed that the primary responsibility for the training of local law enforcement officers would rest with the various training zones around the state. Zone Five, covering the ten counties of Greene, Albany, Rensselaer, Schenectady, Schoharie, Saratoga, Fulton, Montgomery, Warren and Washington found a home at the Hudson Valley Community College in Troy, New York. Over the next several years the partnership between the College and the Zone developed into a program that saw recruit officers attending the Basic School receive college credit for the training they were receiving. By 1994 it became apparent that a majority of the officers attending the Academy had two and four year degrees and the extra college credit they were receiving was of little value to them. 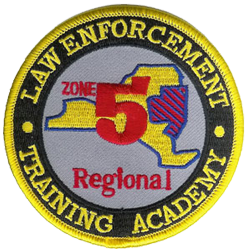 In 1995 a re-organization took place, whereby a group of local Chiefs of Police and Sheriffs formed the Academy into a not-for-profit organization, the Zone Five Regional Law Enforcement Training Center, Inc. The move literally saved the municipalities of the Zone approximately two thousand dollars per recruit for basic school and hundreds of thousands of taxpayer dollars since its inception. The Training Center under the direction of a Board of Directors, representative of the agencies of the Zone, appointed a Steering Commitee comprised of training officers from various agencies to guide and monitor operations of the training center. Each member agency is assessed a fee based on the size of thier department. Monies collected from the assessment fees are used for rent, equipment, salaries and other expenses incurred in the operation of the Training Center. Today the Training Center provides training to over 65 state, county, city, town and village police agencies in a geographical area covering the ten counties of the Zone and other agencies whom have joined from other adjacent zones. To date the Training Center has graduated 41 sessions of the Basic Course for Police Officers and offers regular training sessions in: Police Supervision, Traffic Enforcement, Criminal Investigation, Law Enforcement Instructor Development, Field Officer Training, Narcotic Enforcement, Basic Investigator, Community Policing, Firearms, Evidence Technician, Basic Telecommunicators, Accident Investigation and numerous in-service training programs. In 1999 the first full time Director of the Training Center was hired and it is anticipated that the training program will continue to grow and expand. The Training Center has become an example of Inter-Departmental cooperation. Session 66 monthly food drive.